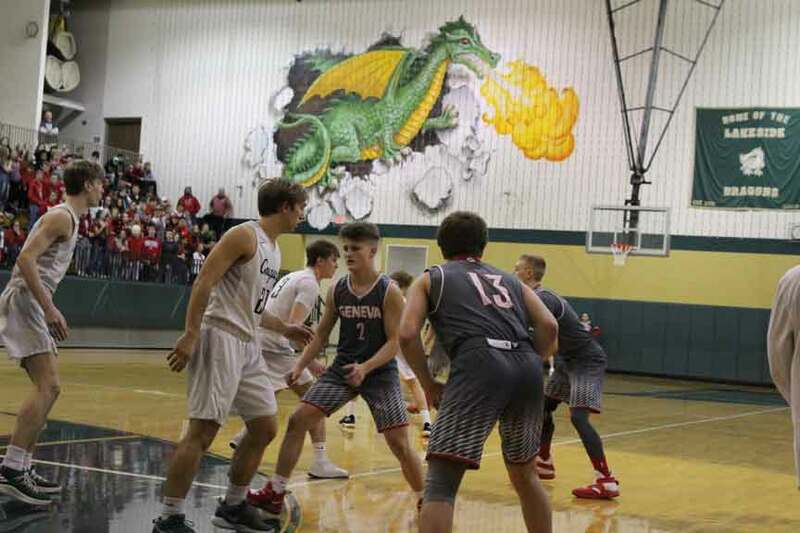 ASHTABULA – The Geneva Eagles boys’ basketball team continued their upset tour with a division II district semifinal win over the number two seeded Lake Catholic Cougars. The Eagles got to the district semifinal game with an upset win over number three seed Harvey, which had twice previously beat Geneva in the regular season. Lake Catholic opened up the game with a 4-0 lead, but a three-pointer by Vinnie Varckette to start the scoring for Geneva gave the Eagles plenty of momentum the rest of the way. Geneva would lead 17-15 after one quarter of play. Nick Stoltz led the way with six points. Dawson Schafer added five points and Vinnie Varckette and Brandon Smith each hit a three-pointer. Luka Eller scored nine of the Cougars 15 points in the opening quarter. Geneva led 27-20 at one point in the second quarter and held off almost every push by Lake Catholic to take a 35-31 lead into halftime. The Eagles were well balanced on the offensive end in the second quarter with five points from Dakota Harvey, four points from both Grant Mihalick and Brandon Smith, three points from Tyler Hartz and a basket from Varckette. Sean Fitzgerald kept the Cougars relatively close with a pair of three-pointers. Luke Fraizer added four point, Eller added three points and Ryan Boruszkowski hit a three-pointer. The two teams would go on to trade baskets in a high scoring third quarter. Geneva edged Lake Catholic 20-18 in the quarter to push their lead to six points at 55-49. Luka Eller and Sean Fitzgerald did most of the scoring for Lake Catholic as they combined for 16 of the teams 18 points. Grant Mihalick took over scoring duties for the Eagles with 10 points. Dawson Schafer added five points, Brandon Smith hit a big three-pointer to keep the momentum for the Eagles and Nick Stoltz added a basket. The scoring onslaught continued in the fourth quarter as the two teams combined for 43 points. Geneva outscored Lake Catholic 24-19 in the final quarter and went on to win 79-68. Lake Catholic cut the lead to 69-64 late in the fourth, but the Eagles outscored the Cougars 10-4 down the stretch. Nick Stoltz led the way for Geneva with ten points in the final quarter to finish with 18. Varckette added six points to finish with 11. Mihalick hit his second three-pointer of the game to finish with 17 points. Brandon Smith added a basket to finish with 12 points. Blake Pete also got on the score board with a late three-pointer. The Cougars only had four players score in the game all in double figures. Sean Fitzgerald scored five points for the Cougars in the fourth quarter to finish with 22 points. Fitzgerald nailed six three-pointers in the losing effort. Luka Eller 23 points in the game, but was kept in check in the fourth quarter with four points. Ryan Boruszkowksi finished in double digits with 12 points and Luke Frazier finished with 11 points. With the win the Eagles advanced to play the Villa Angela-St. Joseph Vikings in the district championship game. Pictured: The Geneva Eagles face the Lake Catholic Cougars in a recent tournament basketball game.